Tugger likes lemon balm. See more of this pooch via smalliepillar on Instagram. Tugger the adorable pooch, above, is totally into the lemon balm growing in his owner’s kitchen. 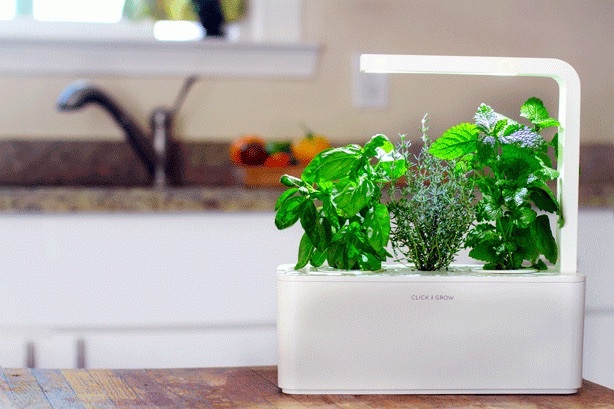 Want to grow your own herbs on your countertop with something that is as smart as it is good-looking? 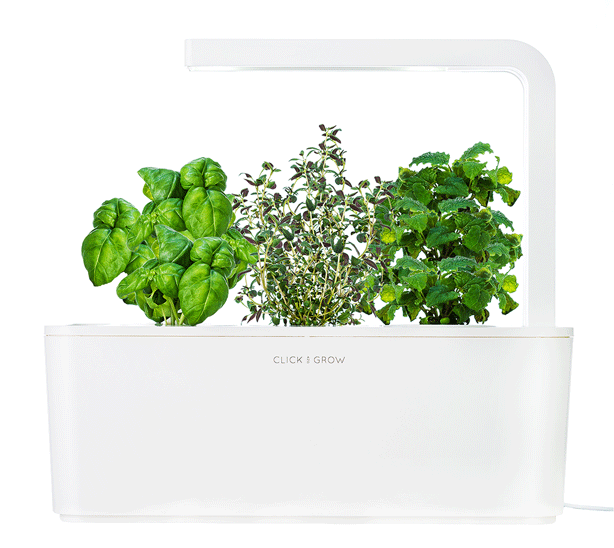 With Click and Grow’s high-tech kitchen garden, you can effortlessly grow basil, thyme and lemon balm all together at once. 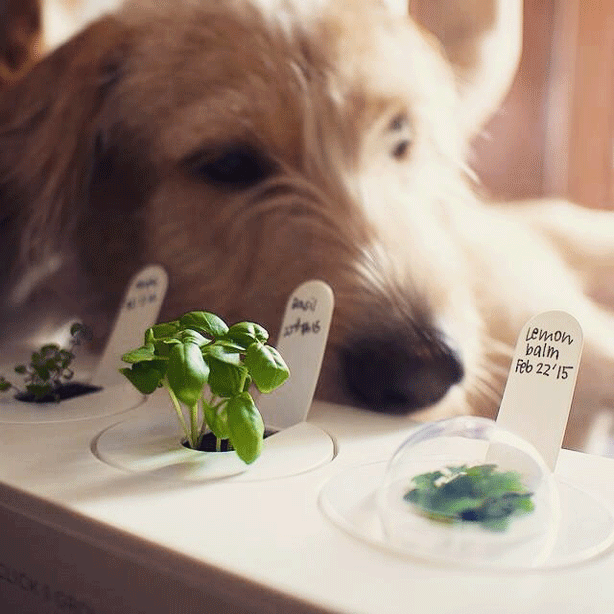 Now don’t be intimidated by this brainy tabletop herb garden. 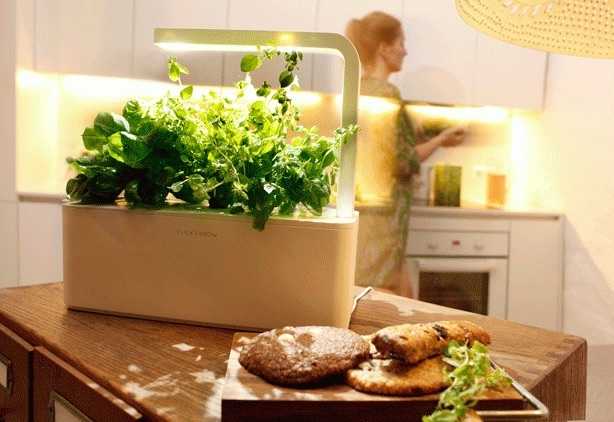 The Smart Herb Garden is so easy to use that the New York Times compares it to changing a printer cartridge. 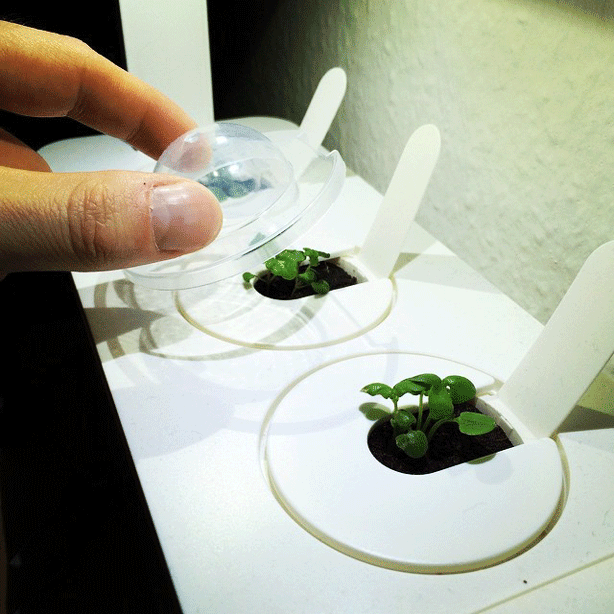 In fact there aren’t even any tips to give, because the Smart Herb Garden essentially grows itself. Easy growing. Follow mondtagskind on Instagram for more. To cultivate your herbs (basil, thyme and lemon balm are provided), all you need to do is pop in the plant cartridges, add water to the tank, plug it in, and admire how cool it looks. 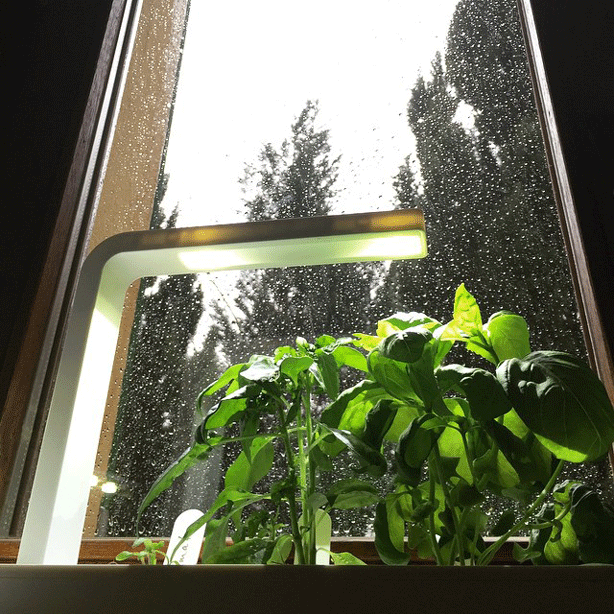 The integrated adjustable LED light offers just the right spectrum while the Smart Herb Garden’s sensors manage the whole process. Go and grow. When you’re ready for new plants, just replace the old cartridges with new ones. The soil itself is a NASA-worthy nanotech growth medium that consistently provides the perfect amount of water, oxygen and nutrients. If you forget about it, The Smart Herb Garden has your back–it attentively measures the health of your plants while you are at work, at play, or both. Rainy days with no sun: no problem. For more, follow dhafreak on Instagram. Clean love: no GMOs or anything that’s not natural. Despite all its clever technology, the system is 100% natural: that means no GMOs, pesticides, fungicides, insecticides, or plant hormones. It’s a chic looking marriage between nature and technology. 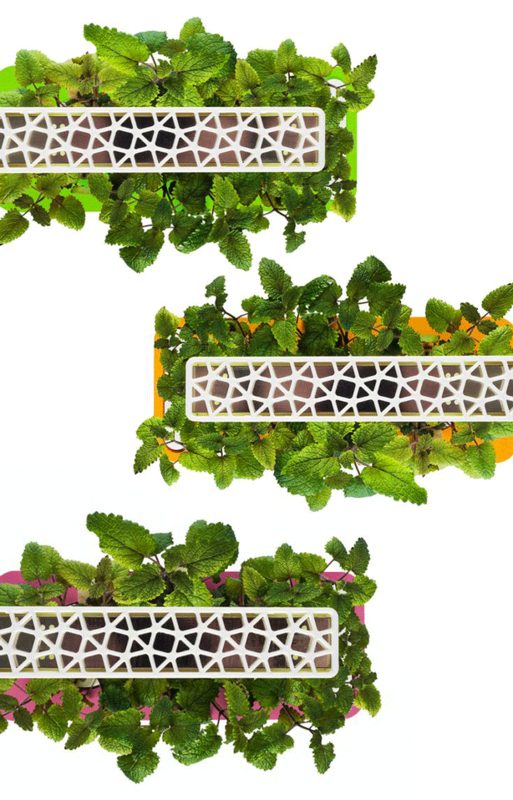 Smart Herb Garden offers 3 lid color choices. Creator and founder Mattias Lepp’s mission moves beyond making plants easier to grow. He wants to change the way people think about plant cultivation all together. He feels everyone, even those who live in crowded urban environments, should have the chance to enjoy the magic of nature and grow their own food. And he wants it to be easy-peasy. 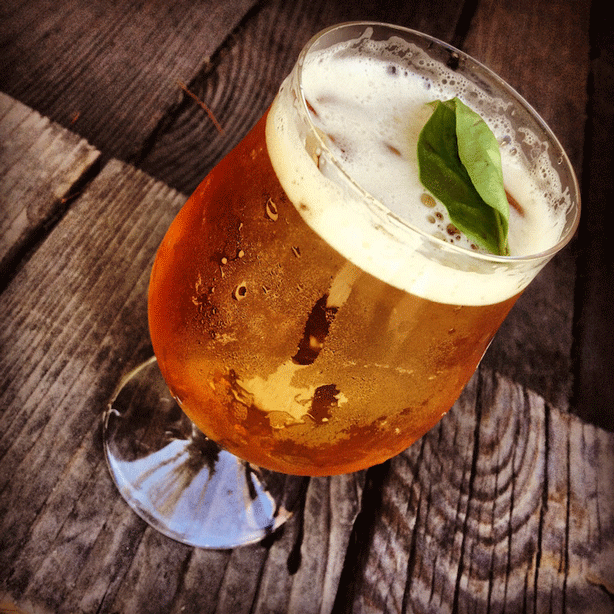 And while you’re at it, why not check out a rcipe for Honey Basil Ale using some of your homegrown basil. Salut! Take a look at the video below to see how simple and stylish the Smart Herb Garden is. Here’s a case where counter-productive becomes countertop-productive, and that’s a good thing.